Playonlinux is a layer on top of Wine to allow more control and easier setup for Windows games and programs. Previously I have used Wine by its-self and had good results to bad results. 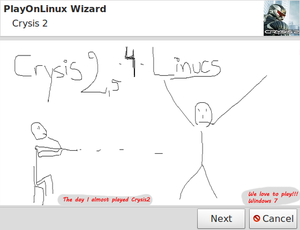 So I am trying Playonlinux to see if it has more success rates. If not, then I'm back to Wine. There seems to be a LOT more documentation for Wine than Playonlinux. Feel free to ask questions or post your results with installing games. Last edited by booman; 27th September, 2012 at 06:08 PM. I've done a restore in order to avoid any leftovers from past mistakes. I've Downloaded Crysis (The original) and will be working today trying various means (Installing though Steam or just installing in Wine>PlayOnLinux ) of getting it to run. What ever my results, I'll be trying Crysis 2 next. I'm a little confused on the whole "library" thing because there are so many and who knows what required for each game.... and do these installed libraries install in Wine too? I had a problem running Magicka and Borderlands because they require direct x and NET Framework. Their automatic install would NOT work. So I tried the libraries in Wine and still no luck. When installing a game, watch the installation and take note of what its trying to install. because if it doesn't work, then you may need to install one or ALL of those in your Playonlinux Virtual Drive. Interesting. so Playonlinux automatically installed the version of wine that works with Crysis? While Chris is playing Crysis 2 and various other games.. 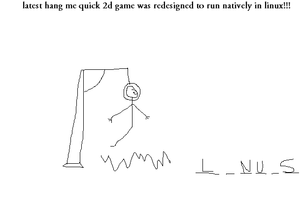 Some people are using the "mighty" tool unjustly called playonlinux. I suggest changing the name of that piece of software to ALMOST PLAY in linucs! I am creating a tutorial for running & configuring games in Playonlinux. I just successfully ran Titan Quest... It took a few trial-n-error with the display settings, but not it run perfect every time! Looks GREAT too! As to Crysis in POL I started the DL thought POL and realized I couldn’t monitor it's progress, So I look at my Connection speed in System monitor, it's random and pathetic, it would take years to DL it. Last edited by chrisbard; 13th September, 2012 at 10:43 PM. As to Crysis in POL I started the DL through POL and realized I couldn?t monitor it's progress, So I look at my Connection speed in System monitor, it's random and pathetic, it would take years to DL it. 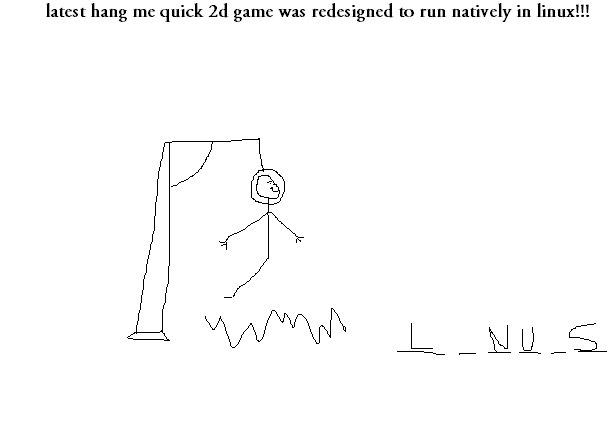 That would actually be OK since it's gonna take years anyway until Crysis will be playable on linucs! 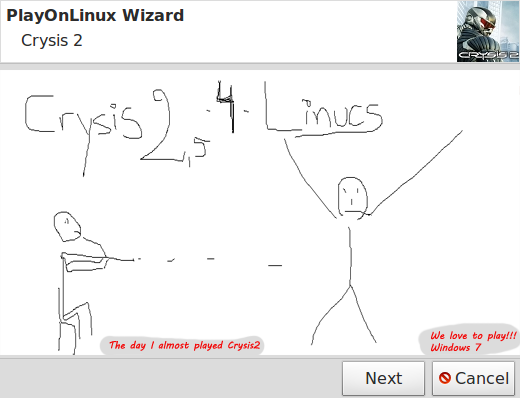 I've Played Crysis in Linux for half an hour. Wine crashed when I tried to Re-play Crysis... What one man can do another can do better... I'm afraid that time will smother all your protests in games designed to run on Linux or PS3 (Linux) why would any one still port to MS and give up 4 or 5 new games just to phone home? when you tried to replay what happend? I'm glad it actually worked!